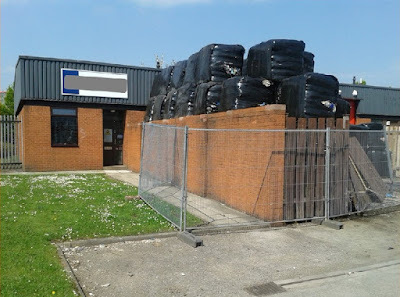 The Environment Agency is issuing warnings to farmers and commercial property owners in South Yorkshire about waste criminals abandoning properties filled with baled waste, leaving the owners with the clean up bill. Jamie Fletcher, from the Environment Agency, said: "Waste criminals operate throughout the country, offering to remove waste cheaply and then dumping it in fields or empty warehouses. They tend to move to new areas as enforcement agencies become wise to their activities. We know it's only a matter of time before they target us again so we're sending out a strong message: Waste criminals are not welcome here and we're doing everything in our power to deter and catch them. "We can't do it alone. We work closely with partners to share intelligence on illegal waste activity. And we're encouraging everyone to do their bit: for property and land owners to be vigilant and better protect themselves and for all businesses, organisations and individuals to manage their waste responsibly, preventing it from getting into criminal hands in the first place." - Check any empty land and property regularly and make sure it is secure. - Be vigilant and report any unusual behaviour. In addition to removing the waste, costs could be even higher if land is contaminated or insurance premiums rise as a result. Dumped waste is also a major fire risk. Last month, bosses at a local recycling firm received sentences after serious environmental permit breaches result in numerous fires. Corporate officers working for Nottinghamshire Recycling Limited (NRL) and two who worked for Park Farming Limited (PFL) breached environmental permits at three sites in Worksop, Nottinghamshire, and Kiveton and South Anston in Rotherham. The sites were operated illegally despite the fact that NRL had previously been convicted in 2011 for offences it had committed at Shireoaks Road. Kevin Malcom Burgess of Manton Forest Farm, Worksop, Warren Richard Steele of Drury Lane, Doncaster, David Vincent Berry of Orchard Court, South Normanton, Edward Charles Freeman of Stephen Hill, Sheffield, Martin Crowther of Chapel Rise, Anston, Sheffield and Peter Charles Sanderson of Peak Close, Bramley, Rotherham, were sentenced at Sheffield Crown Court. Defendants linked to NRL continued to act illegally after the company had previously been convicted in 2011. Documents discovered during the course of the Environment Agency's investigation clearly demonstrated that company officers were fully aware that the sites were being operated illegally. The agency said that the companies repeatedly operated outside the terms of their environmental permits for financial gain and that waste was stored in huge quantities outside of the businesses' permitted areas. Waste was blended at both the Worksop and Kiveton site in an attempt to avoid higher rates of landfill tax. Large stockpiles of various waste deposited illegally by the companies at the sites still remain and continue to have an environmental impact. Both NRL and PFL entered administration during the period of the investigation. They have since gone into liquidation.